I have an extremely protective shepherd. She is wonderful with me but objects to all other people. I must put her away when company arrives. She loves other dogs. How do I socialize her when she goes for people who come near? 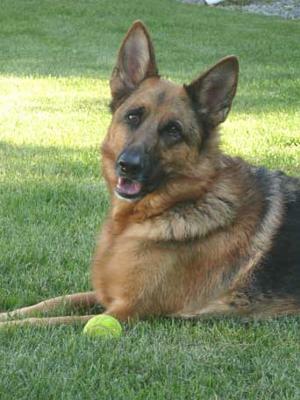 Total German Shepherd: You and your German Shepherd both need some training - and quick. She definitely needs socializing so she'll get used to other people and being relaxed around them. But so do you. I'm sure you mean well but when you put her up when visitors are around you're sending the wrong signals to her which can be very confusing to her so she doesn't know how to react around others when strangers are in the house. Victoria Stillwell has done some wonderful shows on TV (Animal Planet) on exactly what you'll need to do to overcome exactly this. I think the name of her show is "Who's Dog is it Anyway" or something like that. There are probably videos of her on Youtube too. Otherwise you need to get you and your GSD in a training class - quick. And she does need lots of socialization - not solitary confinement. This will just make her worse. But if you want to do it yourself I do suggest you check out the dog training course below. It is very good. But no matter what you do, if you continue to do as you're doing her behavior will never get any better. Training is the only solution to your problem.